Cabbage-leaf coneflowers rise high with recognizable brown heads. In early spring I often receive inquiries about the large, waxy, blue-green leaves that resemble cabbage along roadsides in eastern Texas. These basal rosettes belong to the very attractive giant coneflower (Rudbeckia maxima), also known as cabbage-leaf coneflower, a relative of the familiar black-eyed Susan. I have frequently documented this goliath member of the sunflower family since my first encounter with it in the summer of 1993 while gathering data for my master’s degree. This wildflower ambassador invites us into the wonders of tallgrass prairies, waving among little bluestem, big bluestem, switchgrass and eastern gamagrass. Giant coneflower is an attractive, herbaceous (no woody stem), perennial wildflower found in moist prairies and savannas on sandy, silty and clay soils in the Pineywoods and Post Oak Savanna. Giant coneflower naturally occurs in Arkansas, Louisiana, Oklahoma, South Carolina and Texas. 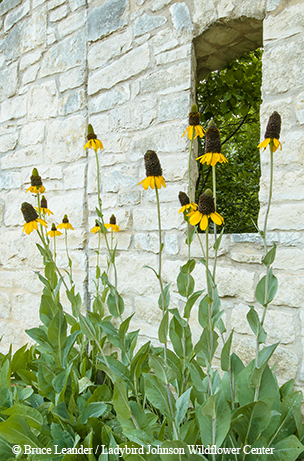 Giant coneflower can reach a height of 7 feet but typically ranges from 3 to 6 feet in height. Majestic flowering stalks ascend from the distinct silvery-blue foliage (leaves average 18 inches). Vibrant yellow ray flowers suspend from tall brown disk centers, blooming from June through September. Discovered by the English botanist and plant explorer Thomas Nuttall (1786-1859) in 1816 near the Red River in Oklahoma Territory, giant coneflower is an attractive native wildflower, resistant to pests and unpalatable to deer and other herbivores. Plants are often established as mass plantings in gardens; flowers are visited by many butterfly and bee species. In the fall, many birds eat the seeds. Despite favoring moisture-loving soils, this plant is surprisingly drought tolerant while able to withstand infrequent, brief flooding. Giant coneflower can be found along roadsides through the eastern third of Texas. Some easily observed populations of giant coneflower occur near the entrance of Caddo Lake State Park and along Texas Highway 43 north of Karnack, along U.S. Highway 82 heading east from Bonham through Paris and on to Texarkana, and along Texas Highway 19 from Sulphur Springs south to Palestine. If you happen to travel through eastern Texas this time of year, keep an eye out along the roadsides for the large cabbage-like leaves of this gladiator-sized wildflower, a beautiful member of our native flora. Size: Foliage grows up to 3 feet tall; flower stalks rise up to 7 feet. Did You Know? Giant coneflower stalks can withstand strong winds.